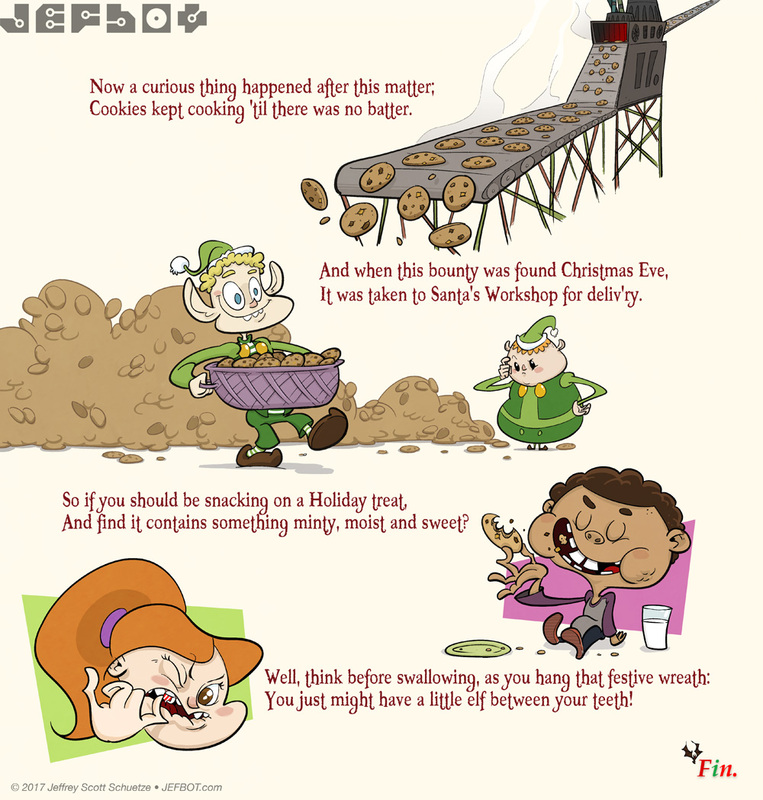 I couldn’t resist this minty, short and sweet epilogue to The Peppermint Elf storyline. Thanks for indulging me! Now that this admittedly long-in-the-making storyline is complete and The Christmas Bat has returned to his dark cave to hibernate, I think it’s safe to move back to our regular programming. I can’t say exactly when that will happen – I just picked up some new work that’s going to keep me busy for about a month (yay!) – but this year I’m going to try and continue to make new comics when I can. Getting back to writing and drawing JEFbot and talking with you readers again has been a ton of fun over the past few weeks and I don’t want to stop now. Here’s hoping I’ll be back in February *fingers crossed* so we can finally move Mu and bot out of that ominous cliffhanger and on with their epic adventure! See ya then. And thanks for that link back to history; reminds me how much I’m missing JEFbot, and your beautiful artwork. Omg. That’s barbaric. I love it. ha! thought you might like it, DJ. Peppermint is a plant. My mom used to keep some in her garden because it repels some species of insects. Sounds like it’s time to do a binge re-read! Yesss…. And that is why I don’t eat Peppermint chip cookies! Boycott Peppermint Cookies! Save the Elves! Sillyness aside, Glad to see more comics from ya, bot! Here’s to a reboot of jefbot: All Dysfunctions Normal! ha! i think it’s a good idea to boycott those peppermint cookies, hobojoenme! at least for the time being. heheh. Well this went somewhere cheerfully dark. heheheh. “cheerfully dark” is a great way to describe it, Maryz. I was going through my normal morning routine when the name “Cornfather” rolled into my mind. I decided to check on the site and was overjoyed by the continuation of my favorite chiroptera! I’m so glad you’re back, Jeff! hey, so great to see you again, SoulMan! love that some psychic “Cornfather” wave drifted through your mind and led you back here. hope to have more comics up, soon(ish)! hey, jefbotfan#300! wow, the whole gang’s nearly back here, now. that’s great, cuz i’m planning on making more strips on my next break! Hey jefbot. Good to hear from you. Waiting in anticipation on your next strip. Btw, the quality time t-shirt, is it available in red? no on the red shirt, jf#300 – i think there are blue and brown versions still but the rest are black. *Dusts off old favorites folder* Holy Sc#@t! Jeffbot’s still running?!?!?!? ha! still keeping the servers up but haven’t posted anything new in a while, RanDumGai (just got that). maybe in the near future if i can find some time?